The world-famous Thang Long Water Puppet Theatre in Hanoi has its roots in an art form that dates back to the 11th century. The tradition of water puppet theatre stems from a time when rice paddy fields were flooded and villagers would make entertainment by standing in the waist-deep water with the puppets performing over the water. Shows at this modern theatre are performed in a pool of water as the stage for the puppets. Thang Long Water Puppet Theatre is one of the most popular tourist attractions in Hanoi with tickets selling out well in advance so it’s worth booking yours as soon as you arrive in town. Don't leave Hanoi without seeing a Thang Long Water Puppet Theater show. These musical stories portrayed are of historical legends and folk tales. Hanoi Water Puppet show is one of the most popular activity in a city tour in Hanoi, this show is organized just one hour but it will make you surprised and understand a part about the daily life of Vietnamese as well as you are heard the folk songs and music in a traditional country like Vietnam. Hanoi Water Puppet Show is taken place in a water pond in the theater, this show display the daily life of farmers such as transplant and harvest, fishing….all around Vietnam so far. 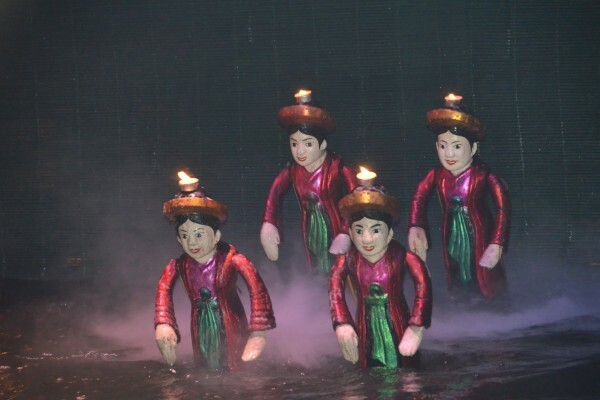 Not only with the adults but also with children like to see this show, and Water Puppet Show is the activity which must be included in your Hanoi city tour. It is easy for you to buy a ticket to see Hanoi Water Puppet Show in any theater in Hanoi center, there are main two theaters in Hanoi city, and the best theater is Thang Long Theater, this theater is located in the central Hanoi and nearby Hoan Kiem Lake the heart of Hanoi capital. But if you have a chance to visit Ethnic Museum in Hanoi in the weekend is Hanoi Water Puppet Show is organized free in this museum in every weekend.